The Bears hosted Baseball Beyond Borders for their final game of Highline’s eleven game stretch. And the Bears definitely did not lack energy. Highline scored four runs in the first inning, as they were able to hold off Beyond Baseball’s comeback attempt, winning 6-5. The Bears led 6-3 in the ninth inning, and Pitcher Tanner Van Lith was called on for the save. After striking out the first two batters of the inning in David Perkins and Josh Enciso, the game seemed to be over. But one crucial error lead to a wild top of the ninth. Catcher Mike Miner grounded what should have been the third out of the inning to third baseman Kevin Nakamura, who would end up making an errant throw over to Bryce Beck at first, resulting in Miner being safe, sparking the teams’ two-out rally. Two more Beyond Baseball players would reach on a walk and a single, which led to Ben Wong’s two-RBI single, to move the game within one run with runners on second and third. But Van Lith would respond to adversity, getting Christian Hagler to hit a soft liner to Beck which would seal the game and the Bears’ second victory of the season. Highline, who was shutout in four of the 10 games prior during this stretch, needed the bats to come alive early, and did they ever. The barrage of runs began after Colton Robinson got hit by a pitch with one out in the inning. Carter Wallace would then single and steal second (he stole third later in the inning), leading to a Kealan Martin sacrifice fly to score the first run of the game. 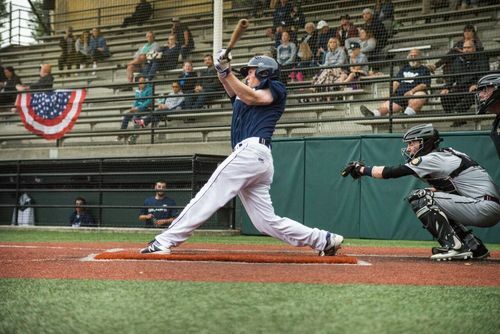 After Clay Spacher and Blaine Wagner reached base on a walk and another hit batter, Armond Swanson III singled to drive in two runs, and Chase Anderson added to the party, singling to give Highline its fourth run of the inning. The Bears have four days of rest until they go back on the road, to face the Bellingham Bells on Wednesday. The first pitch is scheduled for 6:35 p.m. and broadcaster Austin Grad will be at the game announcing it live. Listen to the game live at mixlr.com/highline-bears/, or follow the Bears play-by-play twitter page for end of inning updates.